The henley is a staple of any versatile man’s closet—perfect on its own or layered during the colder months. And while they may be best known for their jeans, AGAVE Denim knows a thing or two about making a henley. Meet your two new favorites: the Brentstone and the Kanan. 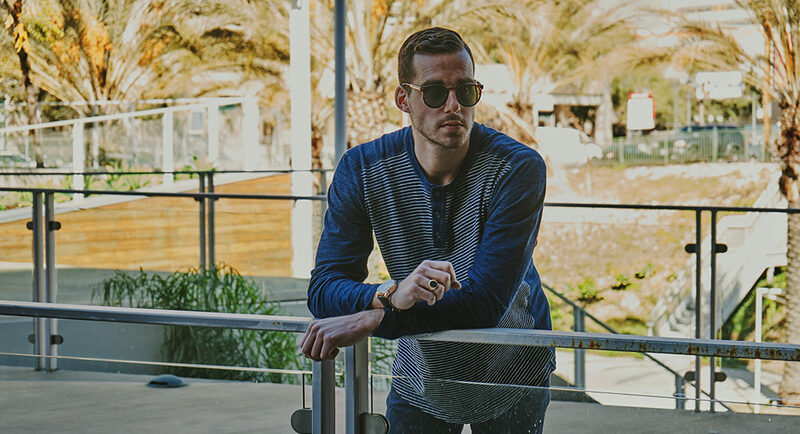 These long-sleeve three-button henleys will elevate any dressed down look. Paired with their No. 30S Modern Fit Draper Stretch Selvedge denim, you’ll be looking put-together fresh in no time. Save 25% off at Agave Denim using the code PRIME25. With dual-tone texture blocking and flatlock stitching, the Brentstone is super well-designed in colors we love. Dress it down on the weekend, or pair with a darker wash for a sharper look. We recommend the No. 30S Modern Fit Draper Stretch Selvedge. As with the rest of AGAVE’s stuff, this shirt is soft as hell. The Kanan offers a unique take on the classic henley. More fabric blocking with two distinct indigo-dyed jerseys offers a striped face with a solid, faded back for a surfer feel. The best feature is, of course, how dang soft this shirt is. We can’t stop touching it. Which is good, because indigo means it will only get better with age, fading and getting even softer. You won’t want to take it off. No outfit would be complete without a solid pair of jeans and these are it. The No. 30S Modern Fit Draper Stretch Selvedge jeans (worn by our guy above) are incredibly comfortable and the slim fit has just the right amount of room without feeling restricted. The 11 oz. 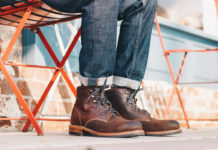 Cone Mills selvage denim adds a touch of stretch for added comfort and range of motion. 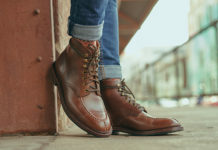 The darker wash complements our go-to pair of boots, especially with the cuffs sitting right at the top. For anyone looking to invest in a quality pair of jeans that will fade and break in beautifully over time—which we all should be by now—these are them. Sign up for their newsletter for style inspo, sale info and updates as they roll out new gear.